New trends of mineral deposits mining in the world consist of intensifying and concentration of mining operations. This is achieved with the help of new technical equipment that is more reliable, having greater service life and more available power. Consideration is given to quantity reduction of stopes and development workings together with their geometrical dimensions growth; also length increase of longwalls and extraction panels is examined. Innovative technologies helping to increase technical-economic indices, extraction volume, working efficiency and safety rules are presented in the book. Specific attention is given to unmanned mineral extraction technologies development using electro-hydraulic management systems of machinery. Plough systems are examined for coal extraction from thin and very thin seams (ranging from 0.8 to 1.2 m of thickness with gaining of stable daily output equal to 2.5-3 thousand tons). Analytical models describing geomechanical interaction between "massif-support" system elements are presented, finite-element method use for research and simulation of stress-strain state around stopes and development workings at coal, ore and other mines are also given. The borehole underground coal gasification technology is introduced with receiving technical gas for electricity generation, and syngas for usage in the chemical industry. 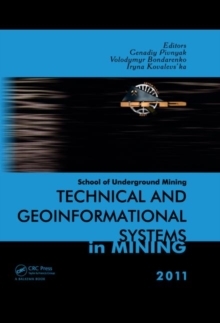 Also research of gas hydrates and development of technologies for their extraction from the Black sea bottom is further scrutinized in this book.